"Service to others is never a chore. It's a daily choice to put others first." 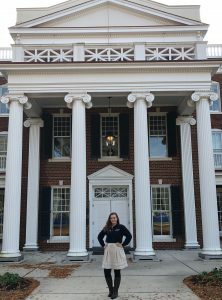 During my second semester of freshman year, I was given the opportunity to serve as a Longwood Ambassador. The Longwood Ambassadors is an organization that gives tours to prospective students and families. In this organization, I have enhanced my public speaking skills and have become more involved on campus. At the beginning of my sophomore year, I was chosen to serve on the Executive Board as the Membership Chair. Having this position was an absolute honor and through running the selections process for initiating new members, I was able to challenge myself and learn how to manage school work and extracurricular responsibilities. Being a part of this incredible organization has been my favorite part of Longwood!